There are so many wonderful wall decals out there. Unfortunately, there’s only so much wall space. Or, you may be worried about putting these cute decorations on your wall. While some claim that they are completely safe, others say no to use on certain surfaces. Instead of passing on all those awesome wall decals, why not use them in different ways? 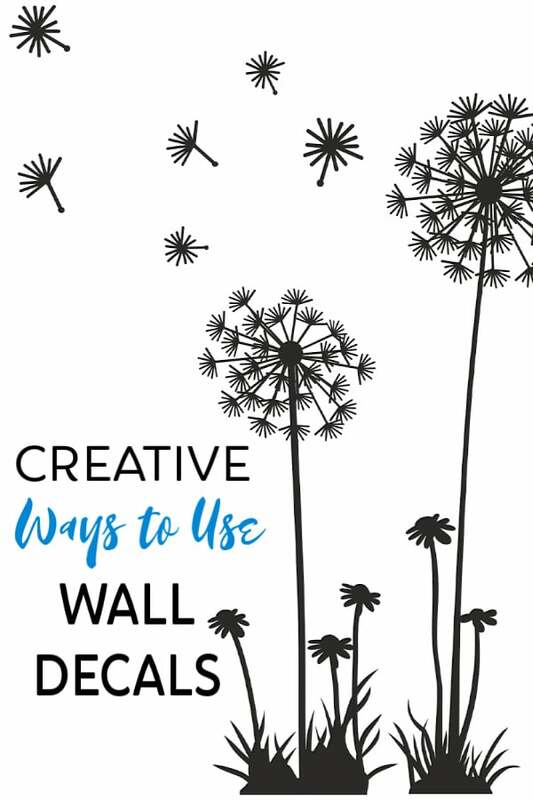 Let’s look at some alternative uses for wall decals. The Dollar Tree is a great place to find wall decals and also a great place to find frames. You can pop the back off the frame and glue the glass into place after applying your decal. Attach ribbon to the back of the frame for a cute hanging art piece. Another option is to put some colorful scrapbook paper into the frame and put the back on. You can then place your wall decal on the glass. This takes that $1 decal and turns it into something really nice. Many of these pieces will stick to a number of surfaces. You can place them on the outside of a binder or even a journal. If you’re into journal art, these are great to add to your supplies. There are so many to choose from. You could even make journals to give as gifts by simply decorating an inexpensive journal from the dollar store. We all know that galvanized metal and wood are hot décor trends. One way you can dress up a simple wood or galvanized piece is to apply a decal. The ones with writing would look great on either. Best of all, when you want a new look, you can just peel them off. Want to add a pop of color to your shower door or maybe make your child’s bathroom more fun? Use wall decals. The Dollar Tree has tons of kids’ decals. You can also find decals that will give an adult bathroom a facelift. Best of all, this is such an affordable option. No one likes doing laundry, especially if the laundry room is boring. Add a bit of fun to your laundry room by decorating your washer and dryer. It’s so simple to do but will make your laundry room a bit more inviting. Let this be the inspiration you need to paint the walls and buy some cute baskets to turn your boring laundry room into the cutest room in your home. Want your kids to put away their toys, but they are too young to read? Use wall decals to show them which bin certain toys go in. For example, if your child loves Shopkins, you can place Shopkins decals on a clear plastic container. You can also create cute storage containers for yourself. Use flower decals to decorate makeup storage. By far the most inexpensive place to find wall decals is at your local dollar store. They won’t always have them and the selection will vary every time when they do, but you won’t be paying much for them if you do find some you like! It’s probably not worth going out of your way for, but next time you’re at Dollar Tree or Dollar General, keep an eye out for wall decals. If you spot some you like, definiely snag them! If you want a great selection and the chance to snag a great deal, check your local craft store. Michael’s and Hobby Lobby have great sales and coupons. Plus, both have a wide selection of wall decals. Because I spend so much time at Walmart and Target, I find a lot of my wall decals there. They don’t usually have a huge selection, but unlike dollar stores, they almost always do have some. And you can’t beat the prices! If you are lucky enough to have an Ikea near you, they also have some cute designs at affordable prices. Wayfair: I buy a lot of my home decor and furniture from Wayfair. They have a huge selection of items, great prices, and their service is awesome. RoomMates: Nearly all of the wall decals you’ll find at other online retailers are the RoomMates brand so it makes sense to go straight to the source for the best selection. They also have all types of characters and sayings. Plus, they also sell stick on tiles which are just as versatile! Wall decals aren’t just for walls. There are so many fun ways you can use them around your home. Whether you want to add a pop of color to your laundry room or bathroom or want to create pieces of artwork, it can be done for very little money.